Is it just me, or does summer feels like it's finally arrived? Maybe it's the 3 bbqs I went to this weekend, or the lingering ache in my legs from the 30 mile bike ride to and from the beach that my boyfriend made me do on Sunday. Or it could just be the fact that Micol's new apt has an above ground pool full of various floatation devices that we lazed around on all day Saturday, while sipping a delicious rose, of course. Oh, and did I mention that Micol's new apt is also only a stone's throw away from McCarren Park, one of the best people-watching spots you'll ever encounter, and a seriously chill place to picnic, lay out, and maybe get in a quick hobo nap? That's what I'm doing above, anyway, so don't judge me. Whatever it is, life in NYC right now is pretty sweet. I love how casual cool this denim outfit is! Love it! ABOVE GROUND POOL! *jealous* I'm loving these photos! I love the look and I love the blue construction site background to match. Also just adore the second to last photo. Def. could see it in a lookbook. Love the denim +denim look! And great photo skills! Looove me some denim on denim! And that bag is adorbs! LOVE love love the denim on denim with the pop of red - so cute! I always worry about pairing denim w/denim. But this works. You look great! I love casual outfits like this. And a cute hat is always a win in my book! Wow you look gorgeous! :) Love the photos! I'm craving for a long time for a denim shirt like yours. Love the red accent. I love the denim on denim! And the pop of red is just right right amount of color, great post!! You look great! love the colour you added with the bag and the detail in the hat! Can't get enough denim and this look is FAB. Love. Cute outfit, it's very California cool. Love the hat. Summer is officially here in Chicago it is hotter than you can believe! The heat index yesterday was 105! So glad to see another blogger taking a break from neon brights, and pattern mixing. While I don't mind it...sometimes it's nice to just dress in monochrome... This is fanastic, I've never tried denim on denim! Great photoshoot! The hat adds so much to the outfit. Love the outfit! And the photos are super vivid...beautiful! Thanks for stopping by my blog :) If you like a furtive look of Northern/ Scandinavian living, please add me :) I try to update regulary. I love this denim look! 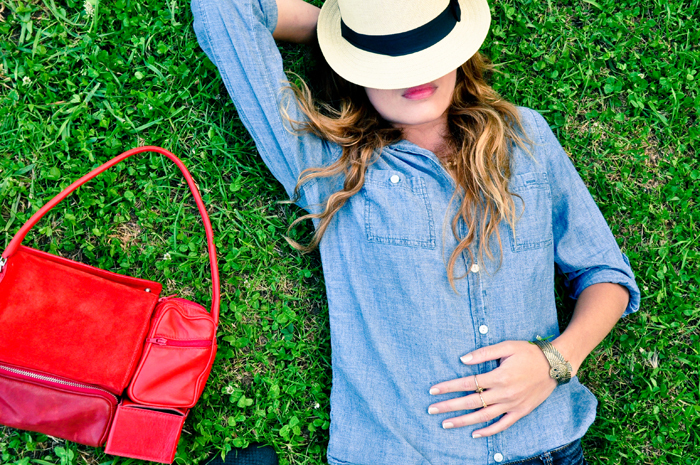 The red bag is the perfect pop of color and I'm loving the fedora! Ok, let me just go and change into a pair of denim shorts, and pretend I look as perfect as that!! Gorgeous look! Perfect denim on denim look. I love the last two shots (they're making me want to play hooky and lay out in McCarren park all week. I'm glad summer is finally here... I can finally break out into full summer-wear. Love casual simple look on you.. you are so cool you rock this kind of look well! That red bag adds the right amount of color and the fedora.. the fedora is gorgeous! hot look, i have a similiar one on my blog!! omg,love the denim on denim look! 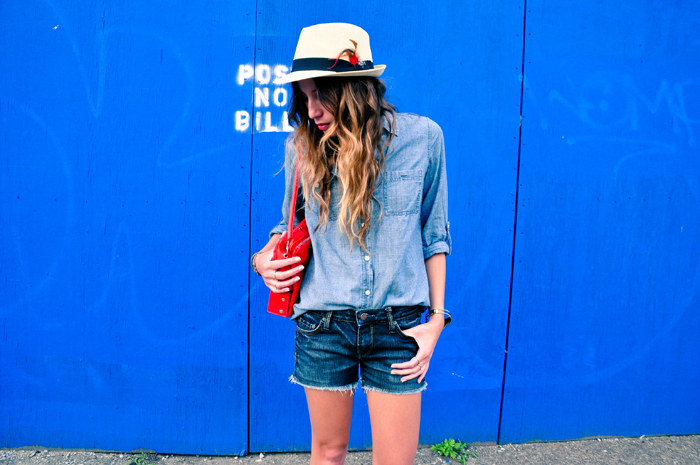 I like how you used a pop of color to the denim look using your birght red bag and cute fedora hat!!! Nice outfit dear, and great blog. Oh hi, this is Amy. And your photographs are so beautiful! Love the red bag the most. Perfect background to this denim on denim outfit!!! These pictures are beautiful! The red bag is lovely and the hat is so nice! ugh, pool apartments. so jealous. but summer definitely felt like it hit, it's sweltering. i love your grass shots- and that cute hat! First off, you are absolutely beautiful. Second, you remind me of Demi Lovato so so so much. And third, I'm so jealous that you live in NY. Fedora + chambray = relaxing weekend outfit! Loving this casual look! I like how you upped the look a bit with the booties! Love them! The cutoffs and fedora are so cute, and then BAM: killer boots. Love this take on mixed denim! Those cutoffs are amazing! The perfect length and the small amount of fringe is fantastic! Beautiful outfit. The shirt is stunning! I would say it is also the temp breaking 90 that has made me sit up and realize it's summer. That outfit is fab and the shots are amazing. Stay cool, ladies! I'm very jealous you get to spend summer in the big city. I'm forced to remain home-bound this year, but maybe next I'll get to experience it, as well. :) Lovely outfit! Love denim on denim. And those low boots rock! lovely look & gorgeous photos!